In the previous introduction I hopefully was able to sketch a slight outline of the basic still water dead drift techniques. To get too technical on the subject is not at all necessary because it is simply not that complicated and if you have fished the dead drift once or twice then it should quickly start to make sense. For those that are relatively new to the sport of fly fishing, however, and who often find themselves caught up in the confusion across the counter ‘technical talk,’ I will start with the tackle suited for this technique. 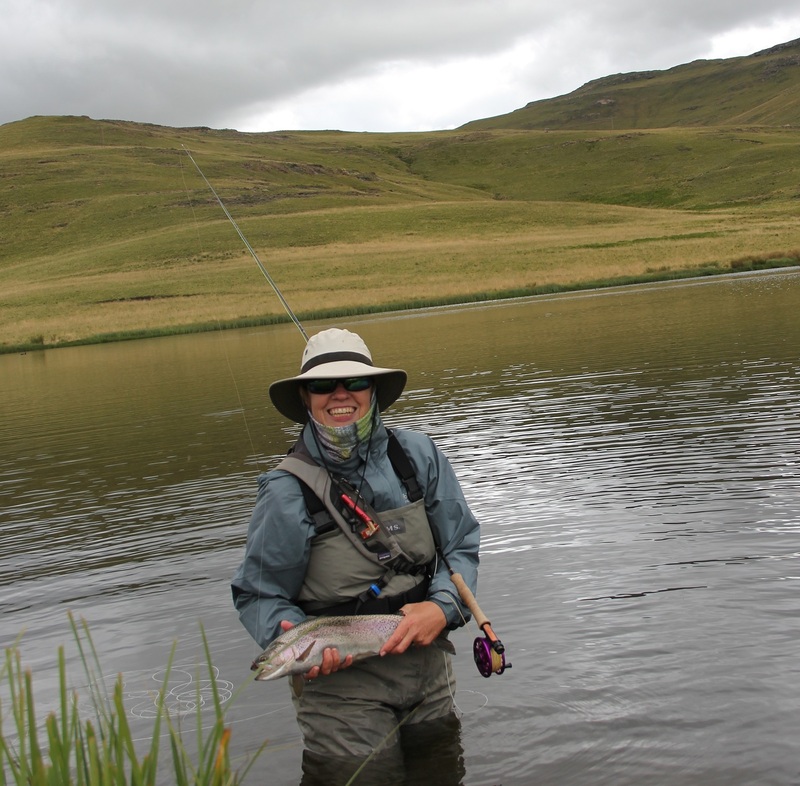 Still water fishing often requires a slightly heavier rod than what is needed on our smaller rivers and streams. The weight of the rod is not necessarily chosen for the size of the fish targeted but rather to cast a longer line and leader more effectively and with less effort. A heavier rod should also, in trained hands, assist in casting the line into or across the wind, often to be encountered on still waters. In my opinion a 5 or 6 weight (9’ or more in length) outfit should be the correct choice. I have often encountered anglers who fish still waters with their 2 or 3 weight outfits and yes, by all means, this is possible but really not functional. Watching even the most competent of anglers trying to make a light rod perform the same job seems an impossible effort as the rod is forced to perform a function that it was not designed to perform. A floating line with a weight forward taper should carry a fly a long way when hotspots such as channels, weed beds and distant drop offs have to be reached. Dispense of that old, cracked floating line that was on the real when you bought it in a job lot at an auction or inherited from your grandfather and invest in new ‘high floater’. A floating line, when fishing the still water dead drift technique, should not submerge at all if the setting of the hook, when the fish takes the fly, is to be effective. Striking or setting the hook when fishing a partly submerged line will result in the energy of the strike being cushioned against the line that lies below the surface. Striking against a dysfunctional floating line will hook the odd fish and prove the contrary, but more fish will be missed. It is important to remember that the hook, 99% of the time, needs to be set when fishing a floating line and the dead drift technique as the fish does not turn on the fly and hook itself (as when stripping a fly through the water column). The fish ‘vacuums’ the fly into its mouth cavity in a non- aggressive motion because the imitation appears to be an easy, vulnerable food source in a suspended state. After the fish accepts the fly it simply continues on its food finding path but if the fly in its mouth does not have the correct texture the fish will ‘spit’ the fly out. The fly thus needs to be set and the easiest way to do so, or quickest route to the fly, is to pick the floating line off the water with the rod in an upwards striking motion. The inability to pick the line up off the water, will the delay the hook-set and invariably cause missed opportunities. Floating lines are porous and pick up a lot of dirt, not only from lying on the ground when stripped off the reel before a cast, but also from dirt and elements in the water and grime on anglers hands. If your new line starts sinking after a session or two it should be cleaned and then treated with a line floatant. I clean and treat my floating line at least after every other still water outing. The choice of leaders should be straight forward but I have found that many anglers often over complicate the process. A 7’ or better a 9’, 3X (+-8lb/3.8kg) tapered monofilament leader will suffice for most of the dead drifting but if fish are as feisty as the ones we often encounter in the highland waters of the Eastern Cape, it might be necessary to up the diameter to 2X. Attached to the weakest point of the leader, in this case 3X as mentioned above, a length of about 3’ or 90 – 120cm of 4X tippet should be attached. A loop to loop connection is an option but I often use a double surgeons knot to attach the tippet to the leader. It is important to ensure that the tippet is lighter (thinner diameter) than the weakest point in the leader. In other words if you are using a 3X leader then your tippet could be 4X or lighter. Fly anglers often attach the fly onto the end of the leader without attaching a length of tippet; this shortcut can often cause some problems. The leader will shorten every time a fly is changed and the diameter of the leader will thus increase and the function of the tapered leader will be lost. If a strike indicator is used to detect the strike and needs to be attached at a specific depth on the leader (without a tippet attached) the diameter of the leader may be too thick and inflexible. A strike indicator attached on the thinner part of the leader will be more responsive or sensitive when the fish takes the fly. The tippet diameter should be chosen with care and often a balance between a too heavy tippet or too light a tippet should be found. If you are going to match a hatch and imitate Trico’s , for example, and you decide to use an imitation that assumes the emerging insect then a fly size of between 18 and 14 should be close enough to the real thing. To have this fly appear as realistic as possible, tippet diameters of no more than 5X or at a push maybe 4X should be considered. This all sounds good but 5X tippet is, in most tippet material brands, very close to the 4 – 5lb breaking strain mark and that is running a little thin when targeting trophy trout that weigh above 6 lbs (2.5kg) in a ‘wild trout’ still water situation. To handle a 10lb brown trout on a 5W rod using 5X tippet in a pristine New Zealand stream is quite possible as the hooked fish could often be followed along the bank and more care, not to over stress the tippet, can be taken. In still water however, hooked fish could make long runs across the dam or down deep to hide in weed beds and once entangled in weeds it is almost impossible to pull free. To stop a fish from lodging itself in weed beds when using light tippet, especially when a lot of line is dragging through the water, can be a chancy task and good fish will often be lost. I would often use slightly heavier tippet material and try to avoid using flies smaller than # 16 or 14 in still water. I often fish a snail or large midge larva imitation (#14 – #12) and then I use a thicker or heavier tippet material, 4X or 3X. I might be sacrificing more takes because the fly may appear less natural on the thicker tippet but if I do hook a fish then my conversion rate is higher. Best advice is to start off using thinner tippet material and if you find that you cannot control hooked fish then step up an X at a time until the right diameter, under the conditions, is found. If you are worried about the effect of a fly stuck to a fishes lip or jaw then crimp the barb of your flies before fishing and the hook should dislodge within no time. I prefer fishing a 9’, 3X leader with a section of 3’ or more of 4X tippet making the total length of my leader/tippet configuration then been about 12’. The length of a longer leader/tippet configuration (12’ – 13’) will keep the fly line away from the fly in clear water conditions. This length could be shortened a little if the water is slightly off colour or murky to allow for better handling or casting in windy conditions. 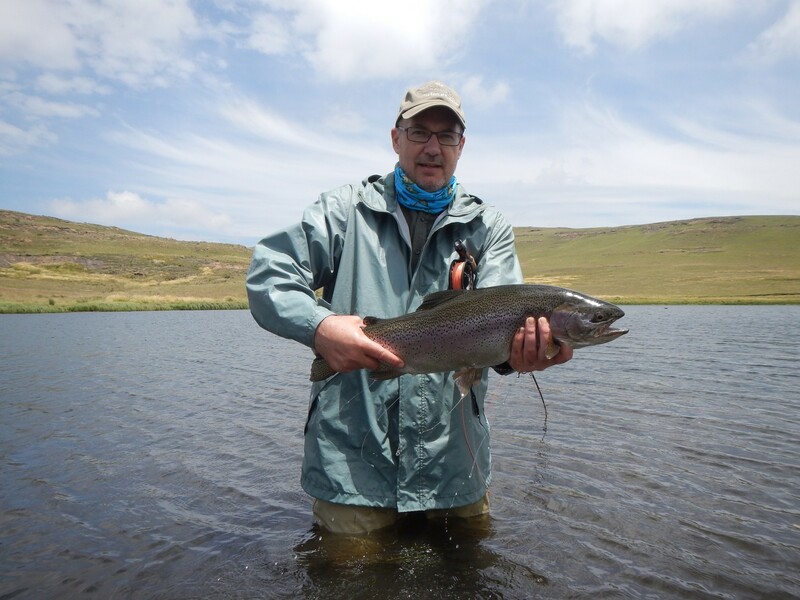 Fly fishing with or without a strike indicator is a matter of choice but in my opinion, if you are not fly fishing every other week then an indicator will improve your chance of detecting a strike by tenfold, when dead drifting in still waters. The strike indicator, similar to fishing with an indicator in a river or stream, does not only detect the fish eating the fly but will also keep the fly at the desired depth in the water column. This is especially important when fishing into channels or onto shallow weed beds on gravel bars. A fly that hangs stagnant and too deep below the strike indicator will eventually settle on the bottom or on structure and not have the desired effect. If you are not sure about the depth that your strike indicator should be set at, then start off by setting it a little deeper than what you think the water is deep, with a little observation on how the fly ‘floats’ and at what depth it snags you should allow for a quick adjustment. It is not at all necessary to ‘hang’ your fly right to the bottom because unlike in a river where currents will sweep away morsels that come up or swim within the water column, in still water food often suspends in certain stages of transformation and fish do feed at different depths. Because unlike in a stream or river, fish need not hug the bottom to economically avoid the currents. In the next chapter fly choices for this style of fishing and the execution of the technique will be explained and conclude the subject.